Video conferencing adoption is increasing as enterprises turn to higher-quality, lower-cost video technology to improve workforce collaboration and reduce reliance on travel. Editor's note: Video conferencing adoption is growing, and IT departments must install and integrate the technology to their best advantage. Whether it's room-based video conferencing, desktop video conferencing, telepresence or a combination, this Expert Lesson will guide you through the decision matrix to choose the best solution for your business needs and technical environment. It will also cover how to evaluate your network needs, technical requirements you may be overlooking, and how to ensure interoperability with partner and client systems. Video quality is improving while costs are falling. Video offers an improved collaboration experience for distributed workers (and therefore a demonstrable business benefit). Video conferencing is being substituted for travel, given declining travel budgets. As video conferencing adoption grows, companies are increasingly looking at ways to integrate it into their unified communications architectures, extend video conferencing to mobile and remote users via desktop and cellular devices, enable video conferencing across company boundaries, and meet the need to manage video delivery and quality. The goal of this Expert Lesson is to guide IT leaders through the video decision process. We'll discuss the physical components of video conferencing systems, interoperability and standards considerations, and how organizations should address video management to ensure quality of service (QoS) for what's sure to be a costly IT investment, but one with a high potential for return on investment (ROI). Before delving into the technology framework, it's worth spending some time discussing the state of video conferencing adoption, the types of video conferencing systems that organizations are now deploying, and the drivers and strategies for future deployments. 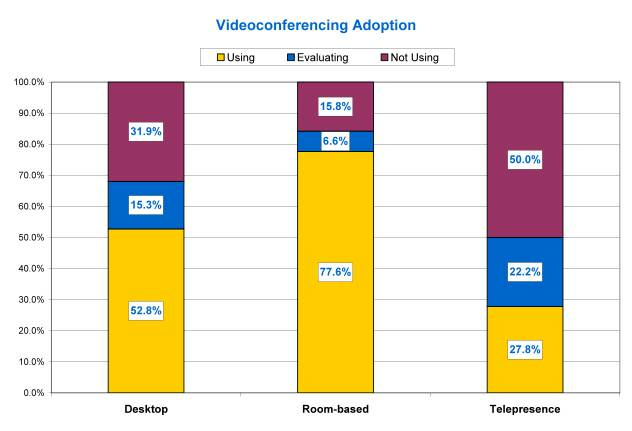 We find video conferencing adoption rates are high among all market segments (desktop, room-to-room and telepresence). Nearly three-quarters of organizations that Nemertes Research works with are deploying or planning to deploy some form of video conferencing, with the strongest growth areas being desktop and telepresence. Source: Nemertes Research. Click the image to view the full-size graphic. As the chart shows, more than half of research participants are deploying or planning to deploy telepresence. Typical deployments are limited -- only a handful of rooms in large office locations. But with the mean capital cost of a telepresence room deployment hovering between $250,000 and $300,000, plus ongoing costs for bandwidth and management, how can organizations justify such an expense, especially in light of flat or shrinking IT budgets? The answer is simply that executives perceive a great deal of value in meeting via telepresence versus room-based, desktop video or audio conferences. Telepresence, unlike other meeting technologies, is perceived as a suitable replacement for in-person meetings. Telepresence's popularity is due largely to the immersive "virtual reality" nature of the technology. Telepresence reduces awareness of the video conferencing systems, enabling participants to focus on one another. Distributed workers are more likely to use room-based, desktop or some combination of video conferencing systems simply to provide for more effective meetings with remote staff. Video, in these cases, provides a higher form of social interaction that captures verbal and non-verbal communications while reducing the amount of multitasking that often takes place during voice-only calls. Managers often drive video conferencing adoption. Should you lease or buy video conferencing equipment? What factors should drive your enterprise video conferencing strategy? How can we improve video conferencing security to protect our sensitive data? "I want to know that the person I'm speaking to is focusing on me and not checking email or surfing the Web," said an IT manager for a large media company. Business leaders tell us they still struggle with defining a business case for desktop video conferencing systems. More than half of research participants are using desktop video conferencing, but deployments tend to be limited in both number of endpoints and usage. Rather than replacing voice, desktop video is most often used to augment other video conferencing systems, enabling home or mobile workers or those unable to get to a video conferencing room to participate in a video session comprising mostly room-based users. Desktop video conferencing is also often used in conjunction with Web conferencing, allowing meeting members to see one another. Rarely have we found companies making large investments in desktop video as a general-purpose application available to large numbers of users, while those that have conducted desktop video conferencing pilots tell us that applications mostly went unused. There are a couple of reasons for the pushback. First, the quality of desktop video, though improving, typically isn't nearly as good as telepresence or room-based video conferencing systems, meaning that the business case for using video to replace in-person travel doesn't apply as well to the desktop. IT managers often tell us that poor-quality desktop video is perceived as an obstacle rather than a boon to collaboration. It doesn't take more than a few poor-quality video conferences to turn users off the technology. Managing desktop video quality is a significant challenge, given the need to integrate support services for desktop applications with those for the network. A poorly performing desktop video application could be the result of contention for PC resources rather than a network issue. IT decision makers also say they are concerned about privacy and cultural implications related to the use of video, especially for organizations with significant populations of at-home workers who do not like the idea of having to prep themselves for a video call. Several participants also say their prohibition of Web cameras for security purposes ultimately blocks the use of desktop video conferencing. One IT manager for a global manufacturing firm told us that his company prohibits the use of webcams within cubicles for security and privacy purposes, meaning that desktop video conferencing within his organization is a non-starter. Despite these challenges, we continue to see a slow but steady uptick in interest in desktop video, especially as video clients become ubiquitous and organizations adopt UC dashboards, such as IBM Lotus Sametime and Microsoft Office Communicator, with an embedded desktop video client. Looking ahead, there are no signs of video conferencing adoption slowing. In fact, organizations often cite video conferencing among services that "survive the cut" as IT budgets are scaled back because of the recession. Indeed, for all the aforementioned reasons -- improved collaboration capabilities, reduced travel, falling system costs and demonstrable business value -- deployment of video conferencing systems will continue to grow. Read more on video conferencing adoption, including articles on the various components of of video conferencing solutions, technology and vendors, a review of video conferencing standards and interoperability considerations, how SIP-based video conferencing can smooth the UC-video integration process and how deploying video management software can aid video conferencing support. Katherine Trost is a research analyst with Nemertes Research, where she focuses primarily on managed and professional services. She develops and manages research projects, conducts strategic seminars, and advises enterprises, vendors, resellers and service providers. Katherine's primary areas of expertise include hosted, managed and professional IT services, as well as channel strategies. Her secondary areas include contact centers, UC trends, enterprise and SMB organizational best practices, and branch-office strategies. Video conferencing is a boon for businesses. This technology helps businesses to save enormous amount of travelling time, cost reduction, instant resolution to customer queries, better client interaction etc. Various companies use web video conferencing tools such as R-HUB web conferencing servers for conducting video conferences.